So the new year is about to start, giving hope that we will be seeing some new phones out in the wild. What kind of phones do you expect to see on the stage? Whatever it might be, 64 bit processors are the new thing so you can expect a lot of that. Here’s Meizu unveiling their latest smartphone, Meizu M1 Note which is a charm. What makes the phone special? The processor, the display, the camera or the price? To be honest, all of them! So what’s the big deal with it? Think about a phone running a 64 bit octa core processor, having a Full HD Display, 13MP rear and 5MP front camera and costs below $200. Got your attention? Now think the price getting even lower. How about around $150 or to be exact $160. This is the price tag that the Meizu M1 Note carries. 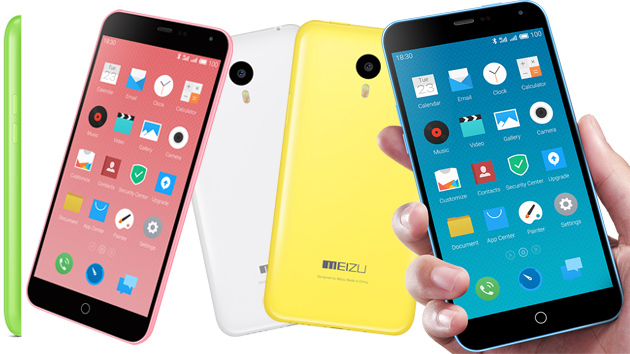 At first sight, the device bears the look of the iPhone 5C.Meizu has a reputation of producing phones looking similar to top brand models but this time it seems like they overdid it. The Meizu M1 Note is armed withthe new Mediatek 64 bit SoC 6752 which runs on eight cortex A53 clocked at 1.7 GHz with the HPM technology which assures you that all the cores can run simultaneously. The new SoC also promises 4G support without including any extra modems for that. Also this SoC has its GPU backed up by ARM’s New T760MP2 clocked at 600MHz. For all the multitasking and app storing, it has 2GB of LPDDR3 RAM along with 16 or 32GB internal storage option. Unfortunately there is no expandability available which is a bummer. The phone weighs only 145 gram with the 3140 mAh battery inside and measures 75.2 x 150.7 x 8.9mm. It has a unibody polycarbonate chassis and can take two SIM cards with a tray that’s accessed from the side. The phone is available in green, pink, blue, yellow and white. The phone is already available in China for pre-order and will be hitting the shelves on December 30th and for the users in US, the M1 Note would debut in the second half of January 2015.